Dress up everyday foods with delicious wasabi-accented sauces, like the Real Wasabi Peanut Sauce, above. Photo by Rasmus Rasmussen. WHAT IT IS: Wasabi-based condiments that are organic-certified—sauces, salad dressings plus wasabi powder for sushi. WHY IT’S DIFFERENT: People who don’t like “wasabi” most likely have never had real wasabi, but the imitation made of western horseradish, which also is used in most “wasabi”-flavored products. The exquisite flavor of real wasabi is skillfully combined in each product in the line. WHY WE LOVE IT: We don’t use many pre-made sauces and dressings: They just aren’t interesting enough. With this line, we are happy to reach for the bottle. WHERE TO BUY IT: RealWasabi.com. CAPSULE REPORT: When we first wrote about Real Wasabi (a Top Pick Of The Week in October 2005), the company had just debuted its authentic Wasabia japonica powder—real wasabi, a rare experience. Most wasabi served in America’s Japanese restaurants is faux wasabi, not an exotic condiment but a mix of ordinary western horseradish root (Armoracia rusticana) mixed with mustard, corn starch and food color. Real wasabi is thrilling to taste, whether you get it fresh-grated at a top-tier Japanese restaurant or mix it yourself from Real Wasabi’s powdered product. Those who don’t like the pungency of the fake wasabi may appreciate the elegance and layers of flavor of the authentic root. The company has since developed an outstanding line of condiments. There now are Real Wasabi sauces and marinades (Ginger Sauce, Peanut Sauce, Teriyaki Sauce) and Real Wasabi salad dressings (Balsamic Vinaigrette, Wasabi Mirin Vinaigrette and Wasabi Ranch Dressing). In a world of unmemorable condiments, the entire line, like Wasabia japonica itself, is the real deal. The Peanut Sauce and Wasabi Mirin Vinaigrette are particular favorites, along with the previously reviewed Dried Ground Wasabi Powder. 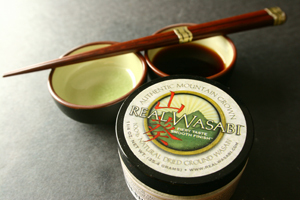 Real Wasabi products are USDA certified organic, and can be purchased individually or in a handsome gift set. Read the full review and you’ll probably wish you had them all in front of you right now. To read the full review below, click here. If your e-mail client does not support anchor links that jump to text above or below, e.g. AOL, please scroll down. Read reviews of more of our favorite gourmet condiments. Review the Table of Contents of the March issue of THE NIBBLE online magazine, plus the back issues archive and our most popular articles. 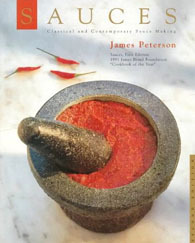 Sauces: Classical and Contemporary Sauce Making, by James Peterson. Almost 600 pages of techniques and recipes create sauces that grace any dish. With a history that dates back to Greco-Roman cuisine, this reference book comes with kudos from such culinary titans as Daniel Boulud, Mark Bittman and Jeremiah Tower. Click here for more information or to purchase. 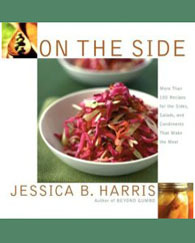 On the Side: More Than 100 Recipes for the Sides, Salads, and Condiments That Make the Meal, by Jessica B. Harris. Recipes for delicious condiments like Easy English Pickles, Tomato Relish, Cherry Ketchup and Pineapple-Rum Mustard, that will make your everyday fare extra-special. Many recipes focus on spectacular side dishes as well. Click here for more information or to purchase. 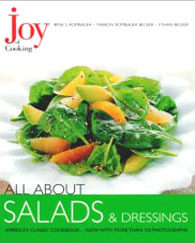 Joy of Cooking: All About Salads & Dressings, by Irma S. Rombauer, Marion Rombauer Becker and Ethan Becker. Salad is so much more than “lettuce.” Just pick your salad category, from green, vegetable and savory fruit, and bean and grain to fish and shellfish, meat and poultry. You’ll find delicious classics and innovations, along with complemen-tary dressings. Click here for more information or to purchase. There is no Easter Bunny, life isn’t fair, and the green stuff you get at sushi bars is rarely real wasabi. You may enjoy it—we do. But faux wasabi is one-dimensional pungency—hot, sinus-clearing fire. Some find it burning and acrid, and don’t enjoy it. Real wasabi is elegant spiciness: warmth, not heat, that quickly fades to a slightly sweet, lingering finish with layers of piquancy that dance on the palate. Think of the difference between Dijon mustard and the yellow stuff. That’s why, at our numerous sojourns to the sushi bar, we carry our pocket-size jar of Real Wasabi powder and mix our own. We invariably make new friends, and the sushi chefs, recognizing us as a cognoscenti (we don’t know the word in Japanese), often toss us some extra goodies. †We do not mean to disparage our own agricultural heritage: We serve horseradish at every opportunity and enjoy it very much. Cultivated in Europe since ancient times and revered for its medicinal and culinary value, it is discussed by Cato in his treatises on agriculture and by Pliny the Elder in his Natural History. But in comparison to Wasabia japonica, it simply does not have the same complexity of flavor. Read more reviews of great condiments on TheNibble.com. Starting with certified organic ingredients, these sauces are simply better than most on the shelf. Real Wasabi Ginger Sauce. 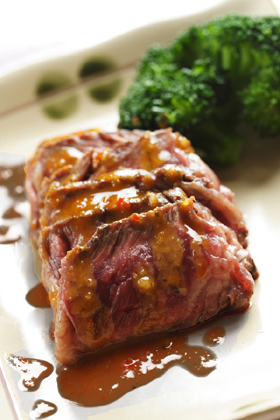 A combination of soy sauce, rice wine vinegar, ginger purée and citrus extracts makes this a very nice finishing sauce for grilled meats, fish and vegetables and a delightful dipping sauce. At 20 calories a tablespoon, we enjoyed it guilt-free on rice, noodles and salad, too. Real Wasabi Peanut Sauce. 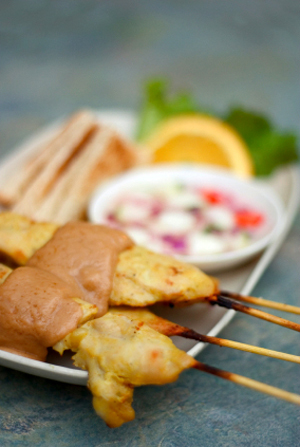 We love this peanut sauce! Most peanut sauces are tasty—even the one-dimensional ones. This one has such a kick, it should win an award for Fusion Food Of The Year: In fact, we hereby bestow the award! Coconut milk, peanut butter, tamarind, ginger purée and chile peppers with a wasabi accent make a simply splendid sauce for chicken, pork chops, satay, kabobs, vegetables—we even like it with French fries! Also use it as a dipping sauce and thin it with water to use as salad dressing or for spicy Asian noodles. Real Wasabi Teriyaki Sauce. After the Peanut Sauce, our palate wanted more wasabi. This teriyaki sauce has just a tad in the recipe: It’s gentle and on the sweet side, but nicely spiked with ginger purée, which adds texture. Have some Real Wasabi Ginger Sauce on grilled beef. If you use bottled dressings, here are some worthy of your attention (and your dollar). 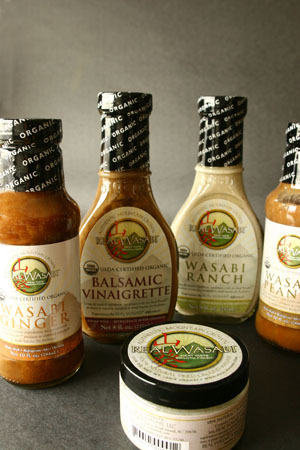 Real Wasabi Balsamic Vinaigrette blends soybean and olive oils with aged balsamic vinegar, spices and herbs. It’s a very nice dressing for anyone who regularly buys a premixed balsamic dressing, but there’s even better to come. Real Wasabi Mirin Vinaigrette mixes wasabi with the sweet Japanese rice wine, mirin (today it’s used largely as a cooking wine, although it was drunk as a sweet sake in the Edo period, 1603 to 1867). The result delivers something similar to the tasty salads served in Japanese restaurants. A winner! Real Wasabi Ranch Vinaigrette will be the star for lovers of creamy ranch dressing. Cider vinegar, lemon juice and spices—including crisp celery seed—are layered on a base of soybean and buttermilk. This salad dressing has a lot of personality: You could pour it on a baked potato or use it as a sauce. 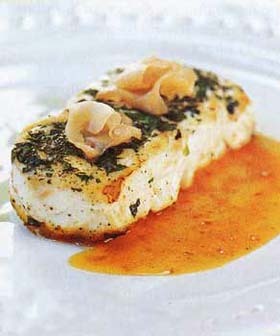 Easy Asian Halibut with Wasabi Mirin Vinaigrette. The recipe is one of more than a dozen on the website that use Real Wasabi products to make sides, mains, condiments like wasabi mayonnaise—even wasabi ice cream! If you go to a top Japanese restaurant, your waiter (or the sushi chef) will grate fresh wasabi root upon serving your sushi or sashimi, using a traditional sharkskin grater, or oroshigane. The root is quite beautiful: If you have the opportunity to have it grated for you, you’ll admire its exotic botanical beauty. Wasabia japonica is a rhizome* that has grown wild for millennia in misty mountain stream beds. It is tricky to cultivate, requiring cool, damp conditions—it likes cold, pristine water with just the right balance of minerals. But wasabi farmers take on the challenge, because the Japanese have long cherished wasabi as a condiment with noodles, sushi and sashimi. For similar reasons, its popularity has rapidly spread throughout the U.S. and other parts of the world. The plant will grow in only a few regions of the world and effective wasabi horticulture practices are carefully guarded secrets. Wasabi is also very tricky to process. Demand outpaces supply, which is why the root sells for $70 and $100 per pound—you can purchase fresh root at RealWasabi.com for $77 per pound (at seven to ten roots per pound, that’s in the range of $8 to $10 per root). oroshigane, or grater (this one is metal, not sharkskin). Just one root costs $8.00 to $10.00. Photo courtesy of Wikipedia. *A rhizome is a plant stem, often called rootstock, that grows horizontally under or along the ground and often sends out roots and shoots that develop new plants. Ginger, iris, and violets have rhizomes. 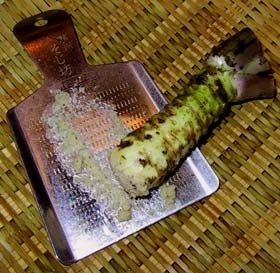 With Wasabia japonica and ginger, the root portion is eaten. All of the wasabi plant is edible, including the leaves, but the root portion produces the finest flavor. Little wonder we are surrounded by “faux” wasabi—1.6 ounces of prepared “wasabi” in a tube can be had for little more than $2.00, and it costs a mere fraction of that when a restaurant buys the powder to mix up fresh each day. Even in Japan only an estimated five percent of sushi bars use fresh-grated wasabi; some establishments use real wasabi powder, but the majority use the same faux wasabi you get at your neighborhood sushi bar. Wasabi is a member of the cruciferous family, that good-for-you group that includes, among others, broccoli, cabbage, white (European) horseradish and mustard. Freshly grated wasabi has a unique pungent flavor, but since it’s related to white horseradish and mustard, there are related notes that can be combined for the “faux” effect. The fresh rhizomes are flown to the U.S. and dried and ground under the watchful eye of the producer into Real Wasabi Dried Ground Wasabi, ensuring that what you get is “the real deal.” It is then packaged in containers like the one below. The small size is easy to carry in a pocket, purse or briefcase to a restaurant—as certain gourmets are known to carry small peppermills with their own special cache of Tellicherry or Sarawak. Then, before pouring your soy sauce, simply mix up a bit of paste in your soy sauce dish with a dab of water. Bring your own jar of Real Wasabi to the sushi bar. Real Wasabi is indeed a gourmet treat—one everyone can afford. The fresh roots may be a bit pricey, but for the cost of a single maki or two pieces of nigiri you can carry a pocket-sized container that will have you “keeping it real” for months (except that all the people around you at the sushi bar will be begging for a pinch of your stock—but you can trade them for beer or saké and come out way ahead). You also can add the dried ground wasabi to your own vinaigrettes, sauces, marinades, jams, mashed potatoes, etc. Might we suggest a wasabi-lime sorbet? Peel and quarter the potatoes; place in large pot, cover with cold water, and bring to a boil over medium-high heat. Reduce to a simmer and cook until fork tender, about 10 to 15 minutes. Drain and put the potatoes in a large mixing bowl. With a handheld mixer on low speed, break up the potatoes. Add sour cream, butter, 1/4 cup of the buttermilk, and wasabi paste and whip the potatoes on medium speed. Add more buttermilk until the desired consistency is reached. Season with salt and white pepper, to taste. If you love to make exciting dishes with little fuss, check the other recipes on the website. Just a dab of wasabi mayonnaise or wasabi aioli, some wasabi in your Bloody Mary or martini will make your cuisine gleam. As for the wasabi ice cream and sorbet: they’ll turn your dining room into a two-star restaurant. FORWARD THIS NIBBLE to people who love zingy-flavored foods—even if they think they don’t like wasabi. ‡The fresh rhizome and ground, dried wasabi products are all natural but are not certified organic; the sauces and dressings are certified because all of the other ingredients except the wasabi are organic, enabling them to qualify as 95% organic. Read more about organic certification standards. Some of the “family”: sauces, vinaigrettes and the Real Wasabi powder. FOR ADDITIONAL INFORMATION, special offers, contests, opinion surveys, THE NIBBLETM back issues archive, product gift-finder, links to our favorite food websites, and the ability to nominate YOUR favorite nibbles, visit www.TheNibble.com.